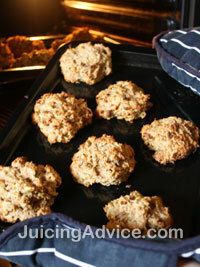 I have just made a fantastic batch of apple pulp cookies. I simply substituted apple for the carrot in my carrot pulp cookie recipe. This recipe is just so simple, you can’t go wrong, and the great thing is they take no time at all to make. In the photo’s you can see my creations. My motivation was I decided to defrost my freezer and found all this wonderful pulp that I had collected. Over the weeks I simply add any pulp to a container in my freezer as and when I’m juicing. The lovely thing is that when you come to make a recipe like this you have a mixture of pulp from all sorts of different apples. A perfect way to get a rich flavour to your cookies. This is a great recipe to get the kids involved with. Apple pulp contains fibre, which is vital in our diets. 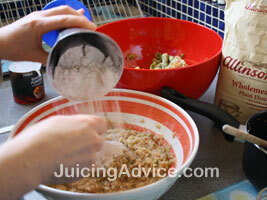 This healthy cookie recipe is a good way to give kids a healthy treat full of fibre. These cookies still look just like a cake, which to kids just simply means a yummy treat. Children are more likely to eat and enjoy these cookies if they’ve been involved in the making of them. So get them involved and have some fun time baking something healthy. 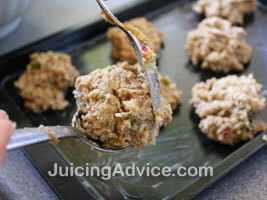 I find these apple pulp cookies provide me with a great energy-boosting snack during the day. As there is no sugar in the recipe it’s great to eat a cookie or two without feeling guilty!